This week, during our continuing celebration of SCI-FI Christmas in July, Christmas TV History will host several guest bloggers sharing their thoughts on Doctor Who Christmas episodes. Starting us off is Nicole Mello. Though she's spent time this month in Europe, she made sure to send me her post early. Thanks for being patient Nicole. And, thanks to everyone for guest blogging this month. Starring David Tennant and Billie Piper, written by Russell T. Davies. Review and summary written by Nicole Mello. This episode of Doctor Who begins with Rose’s lovely mother, Jackie, decorating her house for Christmas and missing her wayward daughter. The plot then turns as she and Mickey hear the sound of the TARDIS outside and rush out to meet Rose. 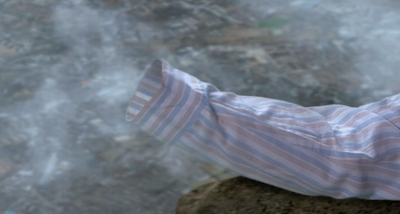 The TARDIS crashes and the newly regenerated Doctor pops out, yells “Merry Christmas!”, and passes out. Rose comes out and explains how this is the Doctor. In the process of regeneration, the Doctor is bursting with energy. Rose and Jackie are taking care of the Doctor, who they believe has fallen ill. They’re both confused by his new appearance, but Rose is upset that the Doctor never explained this to her. They see Prime Minister Harriet Jones on the television, talking about the new space probe, much to Rose’s delight. Mickey, however, decides Rose needs to go Christmas shopping in London to get her mind off of the Doctor and back on him. 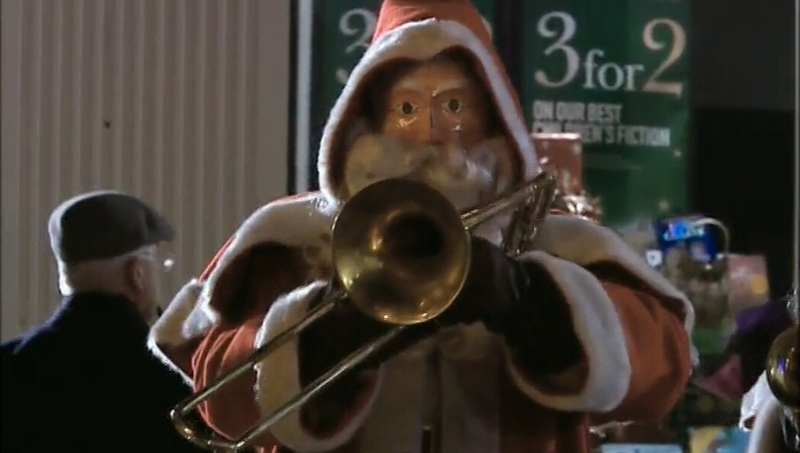 While the two friends are out shopping, Rose notices something odd about the Santas playing trumpets in the square. She’s proven right when the plastic-faced Santas begin shooting flames at the pair of them through their trumpets. Rose and Mickey flee in a taxi and hurry back to her flat, worried about the Doctor. The Doctor, meanwhile, is still healing from his regeneration. Rose notices the new tree, which her mother tells her is from Rose, but Rose knows there must be something wrong. The tree then begins whirring about and attacking Rose, Jackie, Mickey, and the Doctor, who is still unconscious. “Jingle Bells” plays merrily in the background as the group is attacked by the Christmas tree, and Rose leans down and whispers “Help me,” in the Doctor’s ear; he immediately wakes up and stops the tree with his Sonic Screwdriver. The second assault is this deadly spinning Christmas tree. Once the Doctor realizes what is happening, he goes outside and discovers three Santas waiting for him. He sends them away via his Sonic and tells the group that they were just pilotfish. The Doctor is still too weak from his regeneration, and that’s how the pilotfish found him; he is struggling and needs to remain asleep. He is clearly suffering and trying to tell Rose that there’s a danger, and he then promptly passes out again. They bring the feverish Doctor back inside to the bed he had been sleeping in before the Christmas tree attacked. Rose is too worried now to focus on Christmas, as she checked the Doctor’s heartbeats to discover that only one of his hearts is beating. The television is on and tells them that the probe reached Mars, but they had lost contact with the probe and seem worried about it. 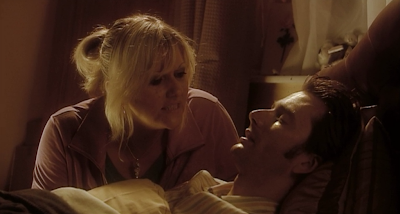 Rose's mother Jackie looks over the Doctor as he remains unconscious. Mickey has researched pilotfish, and now they know that the danger must be closeby. On the television, something is malfunctioning, and a monstrous alien face appears on the screen, much to the terror of the entire world. The man who has been in charge of this probe goes and meets with Harriet Jones and her right-hand man, Alex, about controlling the alien situation. Harriet Jones is knowledgeable about aliens and is not entirely worried. Soon, the team learns that the probe did not transmit any messages from Mars, but the probe is actually far off its mark. 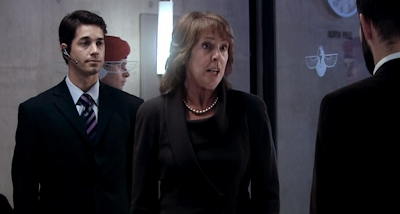 Prime Minister Harriet Jones--remember her from a previous episode? Mickey discovers that a spaceship is coming their way just as the new alien forms come onto all the screens in the world and speak to the humans in a foreign, unknown language. Rose is worried because she doesn’t understand the language, and the TARDIS always translates for her, no matter where she is; this leads to a heavier concern for the Doctor, who Rose declares “broken”. Harriet Jones, meanwhile, is frustrated by the aliens and her lack of ability to communicate with them, and worried by the fact that the Doctor has not yet showed up, and neither has Torchwood. She calls for Torchwood, which is supposed to be top-secret, to come help. The message is now translated, and they learn that these beings, the Sycorax, want to take over and destroy Earth and the humans. Harriet Jones replies that this day, Christmas, is a day of peace on Earth and they will not surrender to these Sycorax. Rose is still worried, believing that this new Doctor is not the proper Doctor, not knowing yet that it’s the same man; she wants him to wake up and save the day, just like he’s always done. The Sycorax Leader casts a spell controlling 1/3 of all humans. Meanwhile, The Sycorax have a reply, but it’s merely some sort of spell that is beginning to control humans all over the country; the humans affected begin to simply walk in one direction. 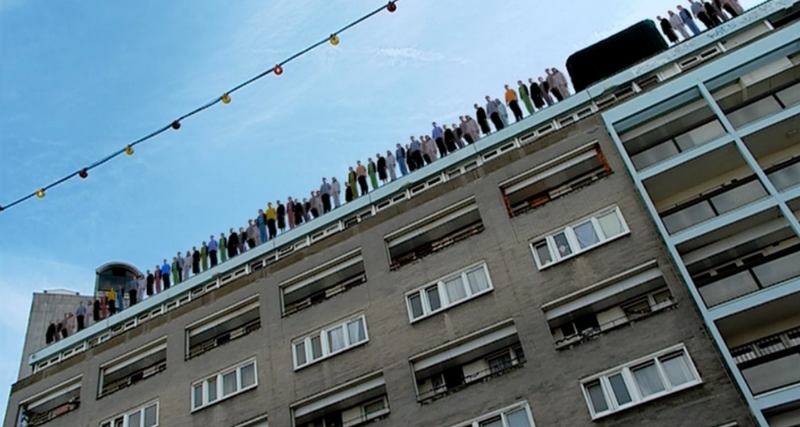 Not all people are affected, and the people who have their own free will continue to try to stop the people who are all walking to the roofs of buildings, seemingly to be forced to jump off. All over the world, now, there are people standing on any roof they can find, any high place; the broken walls of the Colosseum, anywhere they can find. One third of the world’s population is under the control of the Sycorax, about to jump to their deaths against their will. 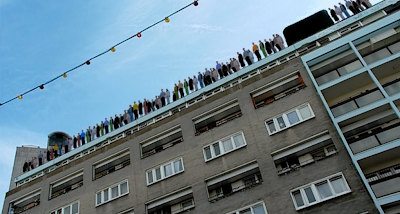 The Sycorax spell has the world's population ready to jump from great heights to their deaths. Harriet Jones still is calling for Torchwood to show up while the remaining team realizes that all the people who are being controlled have A+ blood. The man in charge of the probe remembers that, among the other human culture pieces he put on the probe, he put a vial of A+ blood, which the Sycorax now have. Harriet Jones then makes a declaration to England to remain calm; she then pleads for the Doctor to come, because they need him more than anything to save their desperate world. 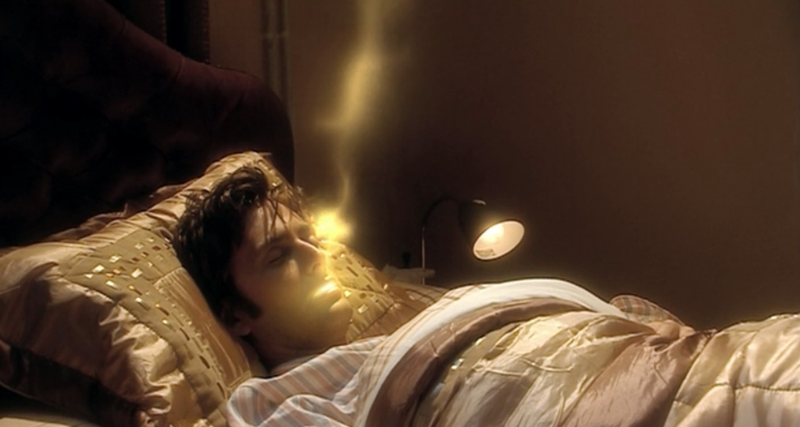 The Doctor remains asleep, still recovering from his regeneration, and Rose breaks down crying, believing that the Doctor is gone and left her. 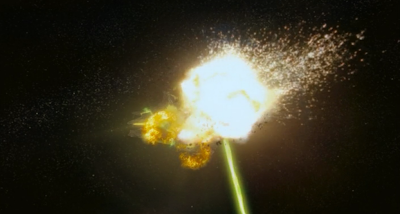 The moment is interrupted by a huge blast, shattering glass all over the world, a massive sonic wave. Rose and Mickey carry the unconscious Doctor onto the TARDIS. Rose, Mickey, and Jackie go outside after the blast just in time to see an absolutely enormous spaceship flying overhead. The spaceship stops over them, and the three of them run back inside to bring the Doctor back into the TARDIS and hide there until he wakes up, as Rose has decided that the only thing they can do now is run and hide. 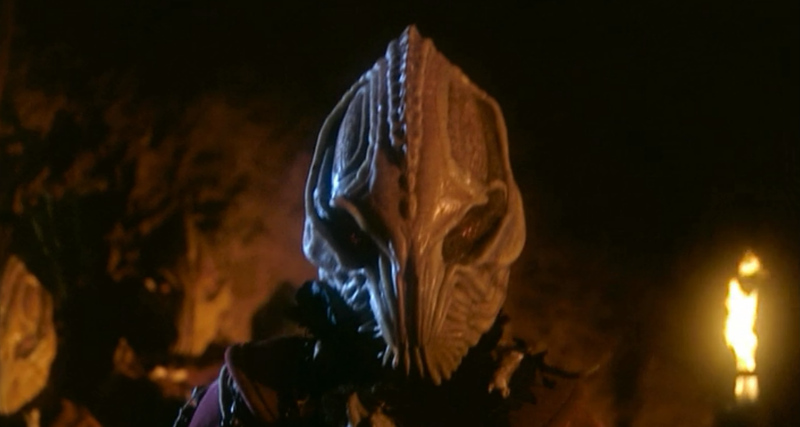 At Harriet Jones’ headquarters, the Sycorax ask her, the leader, to step forward and come aboard their ship. Her and her team of three men - a military leader, her right-hand man Alex, and the man in charge of the probe - are transported onto the alien ship. Rose, Jackie, and Mickey are still working on bringing the Doctor (and a good amount of food) to the TARDIS. 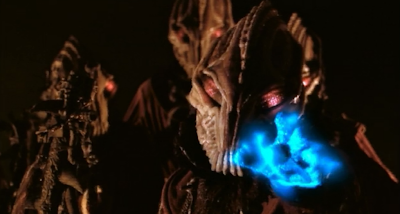 The Sycorax are asking for the Earth to surrender or they will release the “final curse”. The man in charge of the probe begs the aliens to show compassion and leave them be; he is promptly killed by the Sycorax leader. When the military man stands up against the Sycorax, he, too, is killed. The Sycorax leader then tells Harriet to surrender or everyone will die; but, if she surrenders, she can choose that either the humans will be sold into slavery, or the one-third of people that they have control over will die. After removing his helmet, the Sycorax Leader is just as intimidating. Rose, Mickey, and Jackie have gotten the Doctor into the TARDIS as safely as they could. Mickey accidentally contacts the spaceship from the TARDIS, and the TARDIS is brought onboard the spaceship, as the Sycorax believe they are being attacked. 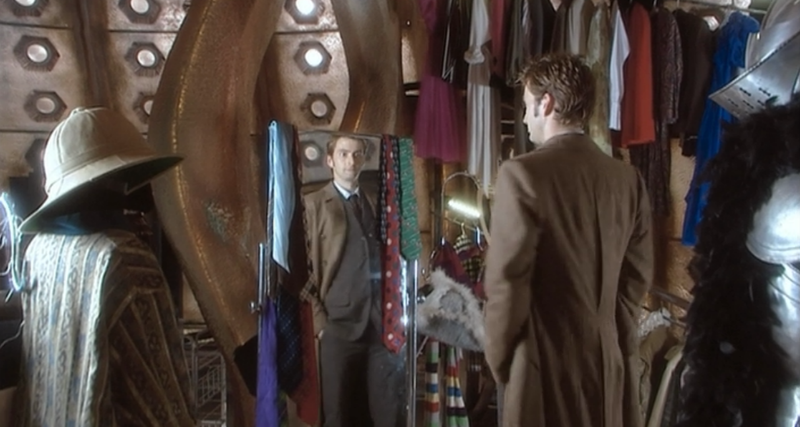 Rose steps out of the TARDIS only to be taken by the Sycorax; Mickey follows her, but shuts the TARDIS door behind him, so the Doctor remains safe. Unfortunately, Mickey is basically a bumbling idiot, and he spilled tea into the TARDIS controls. Harriet takes hold of Rose and tells her it’s all going to be alright. FINALLY! The Doctor emerges, still in his bed clothes. The Doctor, merry as always, greets everyone outside the TARDIS and says that all he needed was a good cup of tea. He is upset that Rose forgot about him, and the fact that he’s not ginger and rude. Harriet is confused by his new face, but the Doctor easily convinces everyone that he’s truly the Doctor. When asked who he is, he says he doesn’t actually know. He distracts the Sycorax by wondering out loud about who he actually is. He investigates the ship and quickly discovers the A+ blood control. He finds a “big, red, threatening button”, and promptly presses it, which brings all the people who were previously under the Sycorax’s control back to themselves. The Doctor quotes Elton John’s song “Circle of Life” from The Lion King to convince the Sycorax to leave the humans alone; when that fails, he challenges the Sycorax leader to a swordfight for the planet. 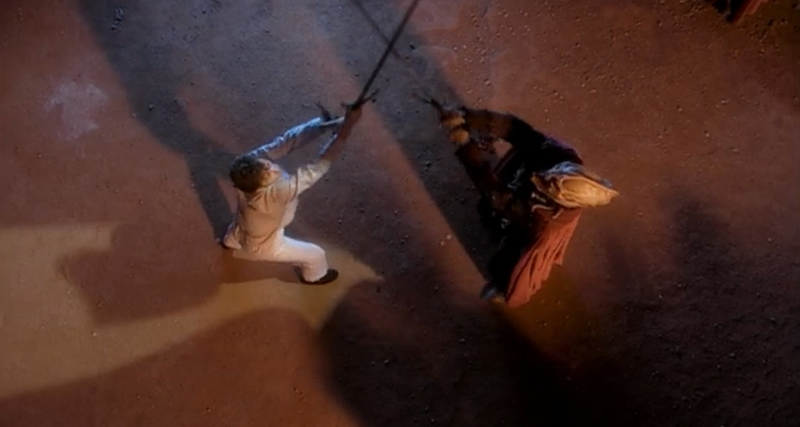 The Doctor challenges the Sycorax Leader to a sword fight! After an intense battle scene, in which the Doctor is definitely the underdog and it seems as though the Doctor is certainly going to lose (he even got his hand cut off, though he did regenerate it), the Doctor actually comes out the victor. He lets the Sycorax leader live, but makes him swear on the blood of his species that he will leave at once and not harm Earth. The Doctor happily walks away, babbling about Christmas, but in the background the Sycorax leader attempts to attack the Doctor again. 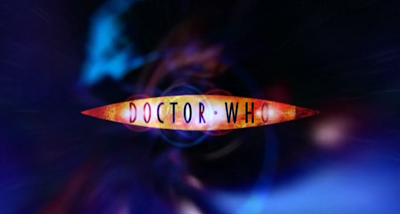 The Doctor presses a new button and the Sycorax leader falls away, to which the Doctor simply says “No second chances. I’m that sort of a man.” He tells the Sycorax people that they will tell others that Earth is defended and no foreign forms should attack again. Oops! The Doctor temporarily loses a hand. Harriet Jones, Alex, Jackie (who has found them once more), Mickey, Rose, and the Doctor celebrate the defeat of the Sycorax. Harriet and the Doctor discuss how noisy Earth is, how they humans are getting noticed and that’s why they keep getting attacked. 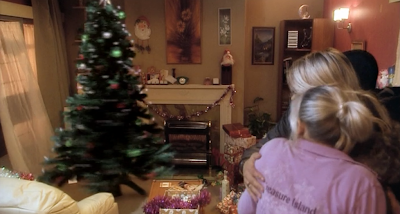 The Doctor, Rose, Mickey, and Jackie have a nice group hug, while Alex informs Harriet that Torchwood is now ready; Harriet, though she knows the Doctor sent the Sycorax away, informs Torchwood to open fire on the spaceship. They do so at once and completely obliterate the spaceship and all the Sycorax who were on it. 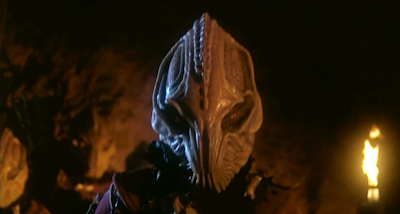 The Doctor is completely pissed off, declaring that that was murder because they were leaving; Harriet says it’s defense, because she knows that the Sycorax would tell others about Earth. The Doctor tells Harriet that he should have told the Sycorax to run and hide, because the monsters, the human race, are coming for him. Harriet tells the Doctor that he won’t do anything bad, that he’s not capable of it, despite how angry he is. The Doctor just whispers to Alex “Doesn’t she look tired?”, and leaves with Mickey, Jackie, and Rose, and Harriet says she’s sorry. The Doctor chooses not to hear. 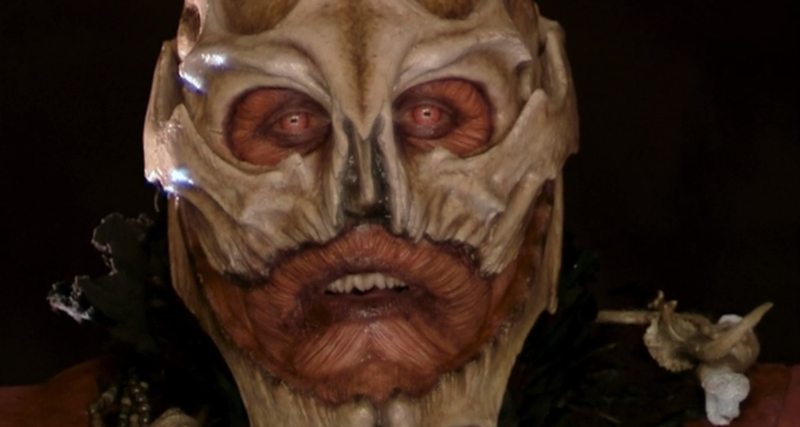 Harriet Jones' aggression (with Torchwood) against the Sycorax. The Doctor, now with his own choice of clothing - David Tennant’s classic grey pinstripe suit, brown trench coat, shirt and tie, glasses, and pink canvas sneakers - joins Mickey, Rose, and Jackie for a lovely, traditional Christmas dinner after he inspects his new appearance. They then notice Harriet Jones on the TV, where she is telling everyone that she is fine, which tells us that the Doctor is trying to tell everyone she’s unfit for her position. The group then leaves the apartment and goes outside into what they believe to be Christmas snow and meteors in the sky, but the Doctor points out that the snow is ash and the meteors are broken spaceship pieces. London's white Christmas is the ash from the Sycorax explosion. Eewww! Rose is worried that the Doctor was going to leave without her, both of them concerned that they’d be alone now that he’s regenerated. Mickey is sad that she’s leaving again, but Jackie maintains that her daughter and the Doctor are absolutely mad. 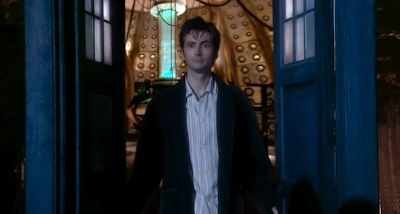 The Doctor tells Rose that their new travels are going to be fantastic as he takes her hand; Rose then asks where they’ll go first, and the Doctor points at the sky and merely says “That way.” The episode then ends with this ending fitting for a Doctor Who Christmas special. 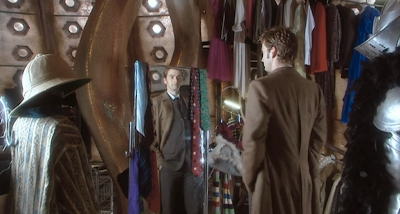 The Doctor selects his new clothes--a pin-strip suit--and begins his new identity. Doctor Who is always full of sadness, heartbreak, and darkness, but it’s easily mixed with humor, romance, and fun. This episode really shows that, as the horror of the alien attack and the desperation and fear of not having the Doctor blends with the traditional joy of Christmas and the season. Though Christmas is more of a background than a plot point, it’s plain that this is a Christmas episode. It’s especially plain because the Doctor Who Christmas specials are always some of the most intense episodes. 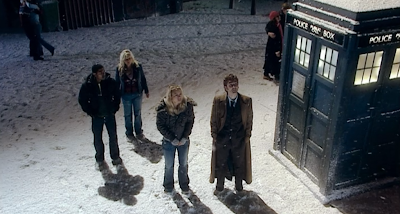 The ending of “The Christmas Invasion” is a great summary of what Doctor Who is; everything looks beautiful and happy, with the snow and the shooting stars, but what the snow actually is is the ash of the dead, and everything is actually dark and frightening underneath the joy. This sums up Doctor Who, because the Doctor usually acts happy, cracking jokes and saving worlds, but what is actually happening is that the Doctor is all alone, with an incredibly dark mind, and the universes he explores are just full of fear and death. Celebrating with Christmas crackers and paper crowns. As far as Christmas specials go, this one only captures what some may call the “spirit of the season” towards the end, with the four people - well, three people and one Time Lord - having a traditional Christmas dinner together happily. If you’re looking for a lovable Christmas special that just screams “MERRY GODDAMN CHRISTMAS,” this isn’t what you want to watch. Try Rudolph the Red-Nosed Reindeer or something along that vein. If you’re looking for an interesting show to watch on Christmas, however - a Christmas special that has a fascinating plot, intense scenes, and is just full of emotion - then look no further. I highly recommend watching “The Christmas Invasion” this Christmas in July. Also, make sure the Doctor’s on your speed dial; you never know when Santa might try to set you on fire. Never been a Doctor Who fan, but this sounds good. Very detailed synopsis! It's a very complicated episode--with plot points that are important to the series and later story lines. She did a good job!